Super Nova is a different take on the genetics that made Chronic the superstar cannabis strain it is – while Chronic is a cross of Northern Lights, Skunk and AK47, Super Nova’s parent strains are Northern Lights, Skunk and Light of Jah. The differences are obvious – while Chronic is a heavier yielder, Super Nova has higher THC levels and thus affect users in a different way, plus the taste and the smell are not the same. So, a person looking for very potent Indicas that are very convenient to grow would be hard pressed to find a better marijuana strain than Super Nova. Super Nova is an Indica-dominant marijuana strain, and that’s how it looks – it’s short, it’s stocky, it has Indica-type leaves, and its most striking feature is the huge main cola. The buds it produces are sometimes called the frostiest buds of all marijuana strains, and are possibly the inspiration behind its name because they look almost like they shine. When it comes to smell and taste, sweet is Super Nova’s dominant note, but it’s not the only one – the smell is also a bit pungent, as is the flavor, and there are tropical hints that complement the overall taste perfectly. 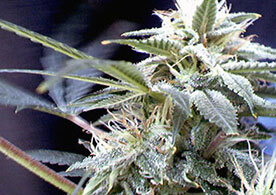 When smoked, Super Nova is not a harsh strain, but when it hits you, you will feel the full power of those 25% of THC. It’s the quintessential stoned feeling of being relaxed to the point of laziness, but with enough of Sativa in there to make you feel creative and happy. Still, because it does make people sleepy, Super Nova might be better suited as a herbal equivalent of a night-cap for insomniacs, than a “good morning, it’s a brand new day” sort of strain to start the day with. Super Nova fares well in a Sea of Green setup, and since the whole plant is concentrated on producing that large central cola, toping would be a bad idea, and completely unnecessary. There are no inherent weaknesses in Super Nova or its parent strains, so it shouldn’t pose any problems to growers of any level of experience. Of course, the rule of thumb that all plants should be checked regularly for signs of common issues like mold, pests and nute burn should be observed, but the chances that you will find any of the above are slimmer than in most cannabis strains. It shouldn’t be a problem for anyone with a working Internet connection to buy Super Nova Seeds online, as there is a decent number of online stores that sell it.